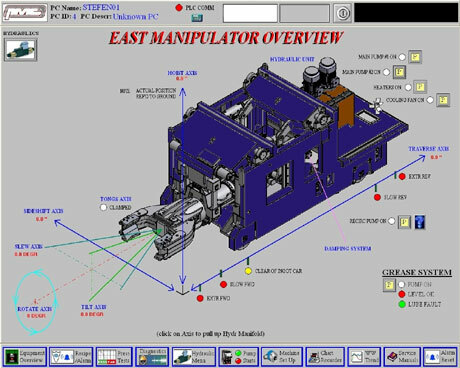 If you want to take your automation control past basic equipment control to the next step, PMC Systems Limited can provide personal computer based HMI packages like Invensys WonderWare®, or Rockwell Automation RS View®, or custom designed C++ HMI specifically for your needs. 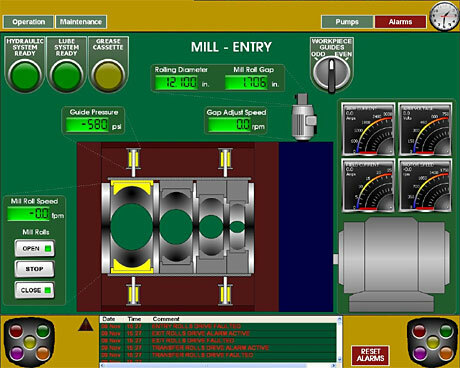 These HMI packages permit detailed graphical displays of your equipment that allow operators a user friendly environment to view critical process variables. HMI screens can be configured for bilingual operation with the touch of a button. HMI stations can be combined with in-depth diagnostics that can show maintenance, using a picture of your equipment, exactly where problems are the second they pop up. Diagnostic displays can even include in-depth troubleshooting guides plus hydraulic and electrical schematics. Plus the software provides the added ability to generate trends of selected process variables, historically save data & trends, and provide network connectivity. Operators and plant floor supervisors now have a detailed window into your process.